Familial cavernous malformation of the CNS is defined as the occurrence of cavernous malformations in at least two family members, and/or the presence of a disease-causing mutation in one of the genes associated with cavernous malformations, and/or the presence of multiple cavernous malformations. Three separate genes: Genetic mutations of three separate genes have been identified as related to the familial form of cavernous malformations. The CCM1 gene is located in chromosome 7 at band 7q11.2 – q21; it is also known as Krev-1 interaction trapped 1 (KRIT1) for the protein linked to the gene. The CCM2 gene is located at band 7p15-p13, linked to protein named malcavernin. The CCM3 gene is located in chromosome 3 at band 3q. CCM1 and CCM3 more frequent than CCM2: The respective proportions of families linked to these loci were estimated to be close to 40% (CCM1), 20% (CCM2) and 40% (CCM3) (13, 18, 69). Disruption of endothelial cell junctions: Both CCM1 and CCM2 mutations cause disruption of interendothelial cell junctions, leading to increased permeability (23, 63, 68, 69). This finding explains the leakage of blood in cerebral cavernous malformations and their associated hemosiderosis and can account for the inflammatory response observed in these lesions (58, 59, 69). Lesions develop over time with CCM1: The CCM1 genotype was associated with a greater number of lesions over time than the CCM2 and CCM3 genotypes (17). 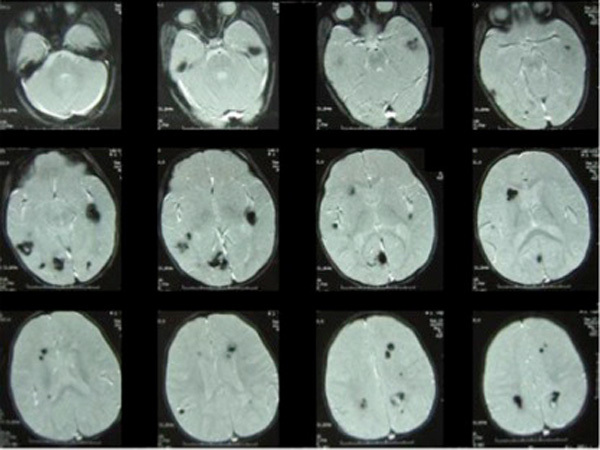 Symptomatic hemorrhage: CCM3 mutations may confer a higher risk of cerebral hematoma, particularly during childhood. 50% of patients with a CCM3 mutation were found to become symptomatic before age 15, and 53% of symptomatic patients with a CCM3 mutation presented with hemorrhage (17). 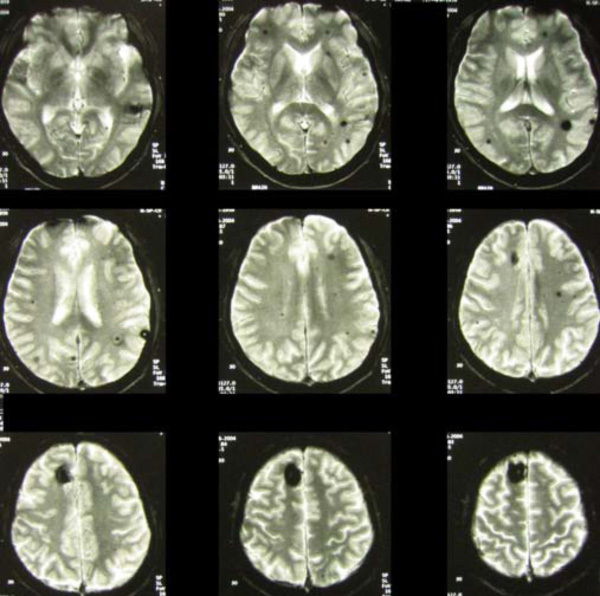 T2-weighted GRE axial MRI of multiple cavernous malformations: The patient is a 1-year-old boy who presented with seizures. Angioma of the left foot: The boy also had an angioma of the left foot. 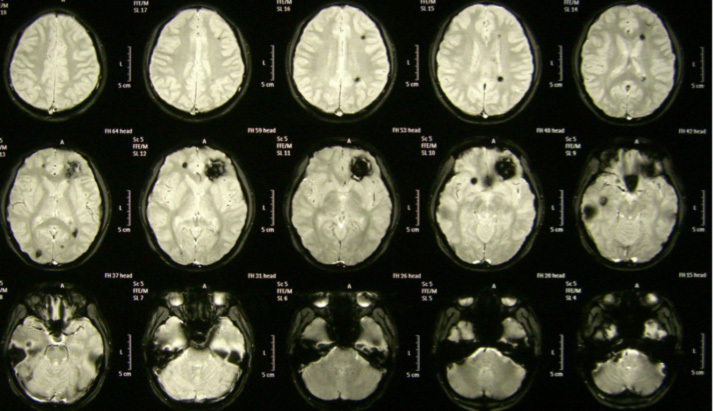 T2-weighted axial MRI of multiple hemangiomas in a relative: The boy’s father had a history of stroke at age 5 years and underwent brain surgery. He has left hemiparesis. Image shows the presence of multiple lesions compatible with cavernous malformation. 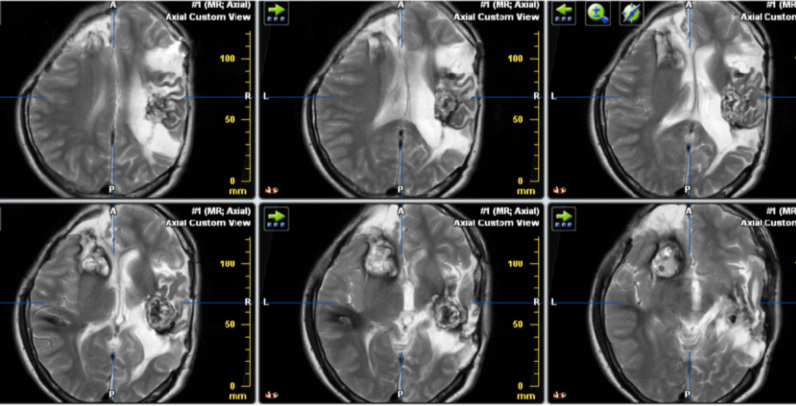 T2-weighted GRE axial MRI of multiple hemangiomas in a relative: The boy’s uncle (father’s brother) had MRI screening at age 5 years. Multiple foci are present with blooming artefact. 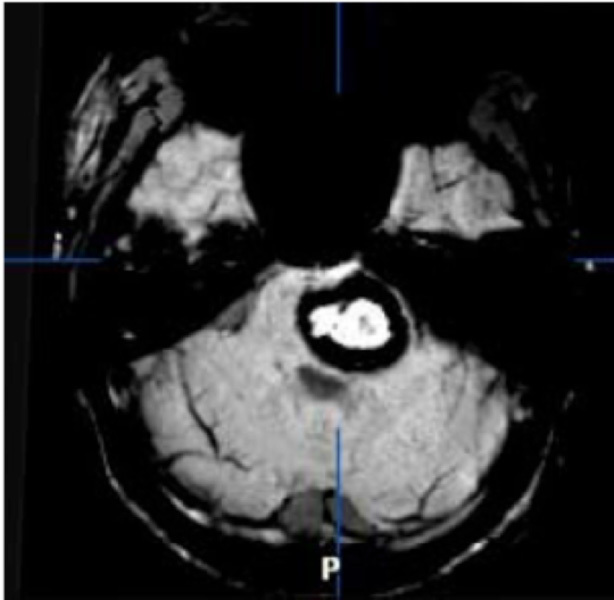 SWI axial MRI of fresh hematoma in a cavernoma: At age 21 years, the boy’s uncle (father’s brother) developed stroke with brainstem symptoms and signs. The MRI shows a new focus with a hematoma in the brainstem that was not found in the previous MRI. T2-weighted axial MRI of multiple cavernous malformations in grandfather: The boy’s grandfather has a history of epilepsy and takes regular anticonvulsants. MRI showed multiple cavernous malformations.